In 1939 my father's birthday gift would be the birth of his brother Harry on Nov 16, a couple of weeks after my Dad's own birthday. This occurred shortly after Canada went into war in Europe. Something very exciting in newsreels and comic books for a boy of 8, but not something that would touch his family's life in the heartland of Canada. On the other hand, 1939 saw a whirlwind of Royal visits and the opening of Canada's first superhighway. 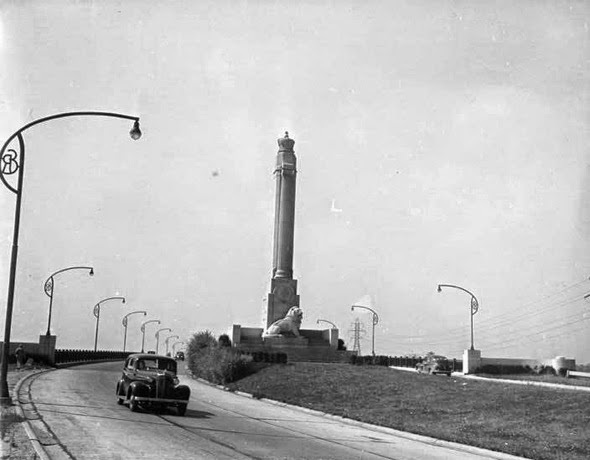 The QEW was a four-lane blacktop not named for the current Regina Elizabeth the Queen, but rather for Queen Elizabeth - the Queen Mum and the King's consort. There at at least two blogs devoted to its ceremonial lion monument with the other about the sculpting couple who created one of its two still-extant monuments. The QEW is so important that even the hipsters of today blog about it. And here - "Historicist: From Magnificent Thoroughfare to Death-Trap"
There's even a cool website about the landau and other ceremonial cars used in the 1939 opening. Many of which are now in collection. Note - My father recently passed away after 83 years on this earth. I'd like to commemorate his life with a memory project by featuring some milestone events from each year he lived. In 1937 my father turned 6 and was now in school. 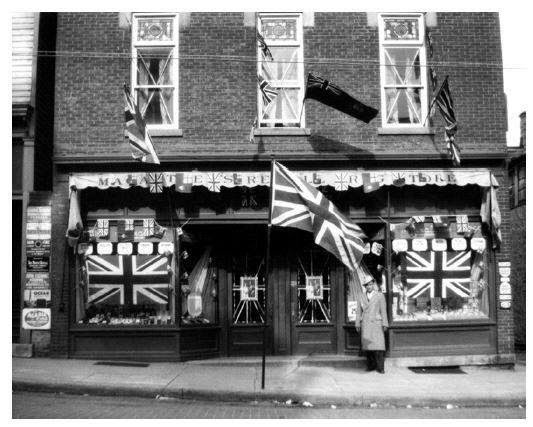 It was an exciting time in Thorold... there was a royal coronation to celebrate as George VI was made King. Yes, this was the "King's Speech" King. Here's the facade of Macartney's pharmacy bedecked in bunting. And it's Still there. 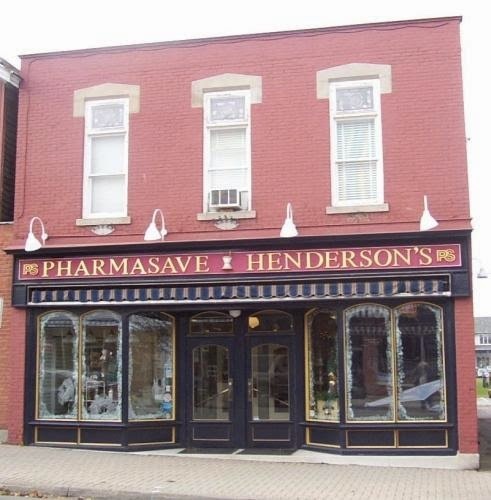 Here's a recent image of the front facade of Macartney's (later Henderson's) Drug Store courtesy of Thorold's LACAC. 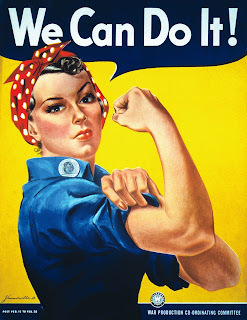 Yet the Great Depression still loomed over the economy. Just up the road and down the hill Fort George was being restored to 1813 splendor, a "famine folly" that used government funds to put food on the tables of the working poor, and ensure an historic attraction that would last to today. Just up the road the other way, Niagara Falls freezes over. Trans Canada Air Lines takes off, serving the upper crust... Eventually they would become Air Canada, with the motto "We're not happy until you're not happy".